Eyebrex is an aminoglycoside antibiotic obtained from cultures of Streptomyces tenebrarius. Tobramycin is usually bactericidal in action. For mild to moderate infection 1 or 2 drops of Eyebrex solution should be instilled into the infected eye(s) every 4 hours. For severe infections including Pseudomonas aeruginosa infections, 2 drops of the solution should be instilled into the infected eye(s) every hour initially. When improvement occurs, frequency of application should be decreased. Therapy should be continued for atleast 48 hours after the infection has been controlled. Eyebrex is a topical antibiotic indicated in the treatment of external infections of the eye and its adnexa caused by susceptible bacteria. Appropriate monitoring of bacterial response to topical antibiotic therapy should accompany the use of EYEBREX. Clinical studies have shown tobramycin to be safe and effective for the use in children. 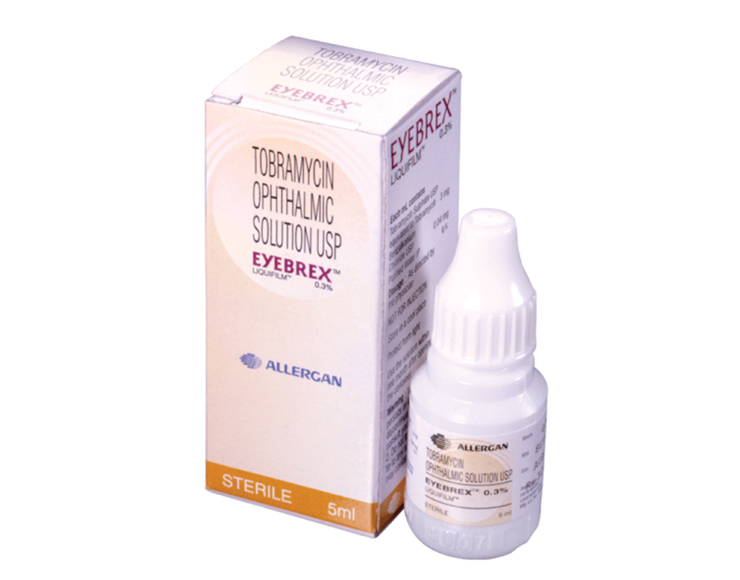 Eyebrex (Tobramycin) ophthalmic solution is available in a 5 mL plastic dropper bottle.